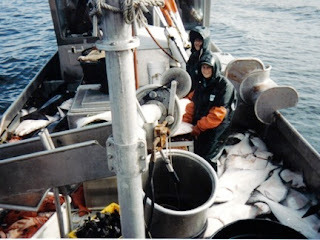 Last week's blog is the story of how, a land-lubber from got hooked on commercial fishing in Alaska. This week we read the rest of the story. Returning to Ohio after traveling home from my summer in Alaska, and spending all my money doing it, I worked three jobs all winter and wondered how I was ever going to make and save enough money to make my way back to Alaska. My cousin, who I staying with in Anchorage, had moved back to Ohio and without a place to stay, my dream didn’t seem possible. But, as fate would have it, after three short months of Ohio, cousin had had his fill and wanted to move back to Alaska. This time to a small fishing town in southeast called Petersburg. He offered to pay my way if I helped him with the drive cross country. Come spring, I was again heading north, but this time in a Toyota minivan. It took about a week to drive to Bellingham, Washington where were caught the ferry. Another four days later and we arrived in Petersburg, Alaska. Arriving in the middle of the night the town was dark, quiet and seemed little eerie. We pulled the van off the ferry and I remember asking “what is that awful smell?” The whole town reeked of the most fowl, appalling, disgusting odor I ever encountered. My cousin simply replied "Fish!" Funny we don't recognize those foreshadowing moments when they are upon us. We drove out the road to cousin's new job as chef at the Beachcomber Hotel, Restaurant, and Bar. The Beachcomber was older than dirt and started off as a cannery cookhouse then converted to a bar, restaurant, hotel. It sits on pilings, though ever so slightly slanted from years of wear, on the scenic Wrangell Narrows a few miles south of town. There was a dock so you could just pull right up on you boat and come in, have a cocktail, and watch the sunset on the back deck. It was also a place where you could sit and watch the commercial fishing boats come and go. They would head out down the Narrows and vanish out of sight only to return a few days later, loaded with fish. I remember being so intrigued by them. And since nepotism is alive and well in Alaska, I was the new house keeper/ van driver/ bar back/ waitress. My room was in the attic, which the person who lived there before me to thoughtfully painted mauve and teal. In order to keep that room, I was kind of a work slave with my four job titles. It seems to me I worked every day and night. Summer came and went, just like the boats. By the time fall rolled around, I had found a boat sitting gig in the South Harbor. A guy was going to be gone about six weeks and wanted someone to stay aboard his leaky 1945 retired Coast Guard Cruiser. Me, not knowing any better, said yes and spent the whole time trying to keep the rain from coming in from above and the ocean coming in from below. At the end of the six weeks, the guy returned. I later found out he had been in jail. Anyway, by then I had befriended some of the fishermen in the harbor. Ron, the skipper on the other side of the slip from me needed a deckhand for the fall halibut derby. Before halibut went to IFQ’s (individual fishing quota) which is a set poundage you are allotted to fish, it was a derby. Meaning you had a set time, such as 24 or 48 hours, to go out and catch as much halibut as your boat would hold. That fall’s derby was for 24 hours. Again, not knowing any better, I jumped at the chance. I was so captivated by these fishing boats, I just had to find out for myself where they disappeared off to. Next thing I knew, I was chopping bait 15-17 hours a day and eating nothing but cold cheese sandwiches, the only thing the skipper packed to eat. We (as in I) baited gear for 5 straight days. I grew up on a farm and was accustomed to hard work but had no idea that it was possible to work as hard or as long of hours as we did. My hands were so sore from gripping the knife to fillet fish and piercing that fresh, hard salmon skin with a hook and I had no idea the worst was yet to come. Four days into the trip, Adam the other deckhand flew out to the boat. He was a young guy, about 25, but had been fishing for years. Made quite a rookie mistake though his very first day aboard. We were running and I was, as usual, at my baiting station. Ron, the skipper came up to me and asked me if I’d seen Adam. “No” I replied, and not thinking anything of it, kept baiting. Once Ron frantically started looking around for him and calling his name did it dawn that no one is every really out of ear shot, or sight for that matter, on a 4 foot boat. Nope. Adam was not aboard. We whipped the boat around and searched the water with our binoculars. Luckily, not too far in the distance, we spotted a little teeny tiny head sticking out of the water. It waved at us. Running full bore back to Adam, we scooped him up and brought him back aboard. He was all macho about it stating that he needed a cold refreshing bath anyhow. I mean, it was a relatively nice day out, but truth is, this is September in Alaska, folks. Ain’t nothing warm about it, he must have been freezing! He changed into something dry and went back to work. What had happened is he went up to the roof to grab some buoys and accidently stepped over board. All I know is if it had been me, who had fallen overboard in that cold water, watching the boat getting smaller as its driving off, without me, into the horizon, I would have insisted that a helicopter or Coast Guard or something come out and take me home! No way would I have gone back to baiting. But, Adam toughed it out. Not too much longer did I have my own chance to tough it out. The next day the weather had picked up as we rounded Cape Decision and headed into Chatham Straight. I was on the front deck baiting but as the weather got worse and it started raining buckets, I moved to the bait shed on the stern, behind the cabin. It was almost all enclosed and stunk of diesel exhaust and the ripe smell of five day old chum salmon and squid. Disgusting. Now, I don’t know how many of you are familiar with seasickness so I’ll tell you some of its triggers. Rough weather is definitely a factor, like the weather that we just turned into. Bad smells is another, like, for example, the combination of five day old chum salmon and squid mixed with diesel exhaust. Being stuck in a bait shed and not being able to see the horizon doesn’t help much either. Needless to say, I can no longer answer “No” when someone asks me if I have ever gotten seasick. I was at the rail, barking at the sharks. And for those of you lucky folks who have never been seasick, without going into too much detail, I’ll just say it’s worse than the worse flu and hangover you’ve ever had all rolled into one, times ten…….thousand. I wouldn’t even wish it on my worst enemy. Knowing that I’d receive no mercy, I kept working. Or, tried to keep working. My knees were so weak I could hardly stand up. I went from baiting one hook every 30 seconds to baiting one hook every five minutes. But, I stayed out on deck. A few hours later, after my toenails had even been launched overboard, we pulled into a cove where it was flat calm. Skipper called me into dinner, cold cheese sandwiches. I said I’d pass, that I wasn’t feeling so choice. He insisted. I crawled into my spot at the galley table and instantly fell asleep. Not sure how long I was out, but when the skipper woke me, I felt right as rain. That next day, at noon, right on the dot, we set out gear. We set gear for about six hours then took a nap. Or, in my case, attempted to take a nap. I was so pumped and nervous for what was about to happen, I really couldn’t sleep. At 10:00 pm we woke up, had cheese sandwiches (I’m not exaggerating, that is all we had. And not yummy toasted cheese sandwiches, but cold cheese sandwiches with nothing but mustard) we started picking up our gear. And we picked straight through the night until the derby closed the following day at noon. 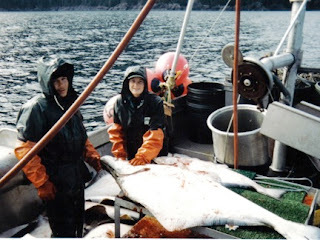 Then Adam and I cleaned halibut and scrubbed down the boat on our way to town. I made $700 bucks in the seven days I was out. And was jazzed about that until I found out Adam, who was only along three or four days, made roughly $4000. Ah well, so goes it. 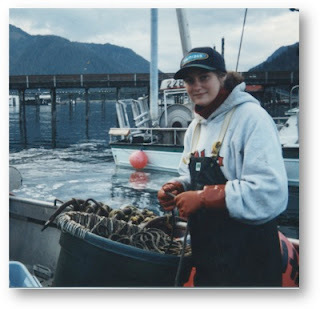 I now had experience on a commercial fishing boat in Alaska……….and was hooked.